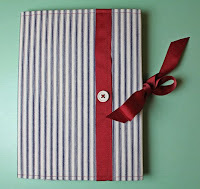 Inspired by Lindsey Cheney of The Pleated Poppy, I decided to make this covered notebook. It's pretty darling, if I do say so myself. 1. I am not qualified to write a sewing tutorial. Seriously. Take no sewing lessons from me. [Insert jammed sewing machine sound here]. I don't know how to follow a pattern, and I have no idea what is wrong with my machine when it refuses to work. However, I channeled the good old high school days, when we had to make paper grocery bag textbook covers, to make this work. 2. Contrast stitching works best if you actually know how to sew a straight line. If you don't, it shows off all your errors (and crookedyness). Also, when you are sewing on ribbon, take the extra five seconds to make your bobbin thread the same as your main thread. Otherwise if your tension is wrong, you will see the (in my case white) bobbin thread pop through from underneath. Don't worry, I have changed my ways. 3. After making one myself I must say, Lindsey Cheney's notebooks are a killer deal. I really adore her ruffly creations and fabric combinations. Another thing I love about her design is that she had the great idea to make them to fit a standard composition book, so when you fill the book, you can just swap in a new one. Brilliant and inexpensive (comp books only cost about $1-2). Being the non-sewer that I am, this took a surprisingly long time to make, though I used fabric and ribbon that I already had, so that didn't cost me anything (just blood, sweat, and tears...). I'm sure it would go faster should I try it again, but it's the same way I feel about cinnamon rolls. In the end I just want to have one, I don't have to make it myself to enjoy it. Thanks for the inspiration Lindsey! So cute! I am going to blog about this along with what I think should be your next craft project! Have I mentioned how jealous I am over how crafty you are?